It is the world's largest dam - and one of mankind's greatest engineering projects. Each component (dam, ship locks, and shiplift) required a massive investment in time, money, and effort. It's the long white object in my illustration's upper left corner. It may look small but it measures 185 meters (610 feet) high and 2.3 kilometers (1.3 miles) wide. Its middle section is the spillway (for letting water out). The left and right ends house massive hydroelectric turbine generators. There are two side-by-side lock channels - the world's biggest. One handles upriver traffic, the other, downriver traffic (both were in full operation during my visit). Each channel has five sequential locks (stages). Each one of those locks can hold a dozen ships at a time. A colossal elevator for hoisting and lowering small ships. Below is my brief summary of the arguments for both sides of the dispute. 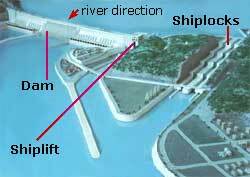 They argue that the dam creates needed electric power, controls floods (which saves lives), aids irrigation and improves navigation, among other benefits. They counter that the project, for example, relocates over a million people, inundates important sites, has environmental issues, and could be disastrous to hundreds of millions of people who live downriver should a severe storm, earthquake or terrorist attack occur.